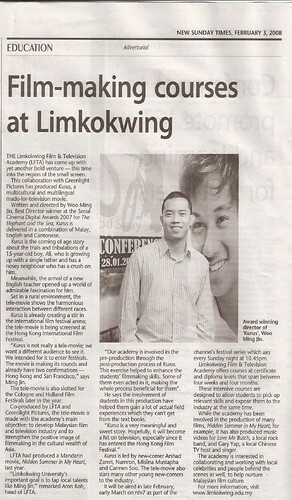 Ming Jin the Mentor and our latest production, KURUS, had been featured in the 3rd of February's New Sunday Times. Aside from the film itself, this article focuses mostly on our wonderful collaborators, The Limkokwing Film and Television Institute and their involvement in KURUS. KURUS (English title: Days of the Turquoise Sky), starring Arshad Zamir, Mislina Mustapha, Nam Ron and Carmen Soo, will be coming to NTV7 soon. Anyway, just a day before this, Carmen Soo and the film, KURUS, were featured in Metro Harian.